Taurus Manufacturing has officially released the Curve, a small, polymer .380 pistol with a distinct curved frame, meant to comfortably wrap around your hip or thigh when carrying inside the waistband or in a pocket, respectively. First, some quick range notes: After handling and firing the Curve I can straight away can [sic] tell you that the 100 or so rounds I fired through the gun fed well and the empty cases ejected perfectly. The long trigger was decently smooth and the recoil, while sharp, was manageable. And not only was the gun a reliable shooter, it also hit where I aimed, thanks in part to its integrated light and laser. How much meaningful information does that convey? What distance, what was the target, what speed, what anything? How about putting a trigger pull gauge and ruler to it? Then we might know what ‘long’ means, in a couple of dimensions. I’m actually interested in doing a comparative test of the Curve. Anything that has generated so much hate without even being seen, handled, or fired deserves a second look. Perhaps I’ll do something even slightly scientific, such as firing it on the same course of fire as a full size gun or perhaps a competitive gun, e.g., an LCP. Larry Potterfield, of MidwayUSA, even developed his own analysis protocol for testing handguns. His procedure is not what I would use but I give him credit for doing something original, measured, and somewhat informative. C’mon guys, this isn’t that hard if you think about it just a bit. You don’t have to put on a Top Gear show to provide some kind of meaningful information for people to use in decision-making. There are so many times in a day when you have to let people into your space. I think we have to accept it. My tolerance changes radically when I’m in transitional areas like parking lots etc. It’s important to take context into account when speaking about SAP. There’s been some commentary about my post that I must not live in a big city or ever take the subway. Since I grew up in Chicargo and live in Atlanta, that’s not true. I ride public transportation quite often, even when I don’t have to. The comment about transitional areas is on point. Rarely are we concerned about being robbed or beaten up in line at Starbucks. The video of the dude getting mugged in NOLA recently is more our concern and representative of the positioning I’m getting at. While public places, e.g., the coffee shop in Lakewood WA, and crowds are not totally risk free, I think my colleague William Aprill would say our risk profile for violent crime is lower there than in transitional areas or when we are alone. The criminal incidents that I personally have had to deal with all fell in those two categories. Either positioning or awareness, along with will, allowed me to control those situations. Controlling the situations allowed them to conclude without anyone getting shot or stabbed, which is my desired outcome. In fact, one of my encounters took place at a MARTA train station in Atlanta at 9 a.m. I was alone and midway through the station on my way to work, so both criteria (alone and in transition) were met. It was what I call an “opportunistic meeting engagement.” Three individuals coming from another direction apparently liked the fact I was on crutches and in a boot from a recent surgery. It was the first time in my life I experienced Clint Smith’s saying “Predators look at you like you’re food.” But I saw their look, change of demeanor, and change of direction from the full width of the upper platform while they were still about 15 yards away. That immediately put me into Condition Orange and I initiated my reaction. Because I had seen them so far away, I had time to react on my terms, rather than theirs. There was no escape for me since I could barely hobble on my crutches. So I faced them, put my hand in my overcoat pocket on my snub revolver and said to myself “Guys, this isn’t going to turn out the way you think it is.” I don’t believe I said it out loud and no words were exchanged between us. At the moment I thought it though, the Marine Corps Drill Team could not have done a better Right Flank, March than those guys did, in unison. Clearly, this was not their first rodeo. What happened was that they targeted me in an obvious fashion. When a sketchy character, or three of them, changes direction and begins to close with you, it’s an indicator that an incident is developing. As a police officer friend says “Nothing good is coming of that.” However, I failed to act in the way I was supposed to. In John Farnam’s vernacular, I ‘failed the interview.’ Most criminal predations on the street begin with an evaluation by the predator as to whether it has the potential for being a successful victimization, as opposed to turning into a fight. Economic predators are not generally interested in a fight. They know all too well that there is an element of chance in every violent encounter. That is not to say they won’t fight, but rather given the choice between a victimization and a fight, they will pick the victimization. So our object is to see them early enough and understand what is happening such that we can set ourselves up to fail the interview. The criminal then moves on to find another victim. I would prefer that they pick an undercover police officer and then get dealt with. However, what happens afterward is not my problem. I am not a police officer; my weapons and tactics are for protecting me and mine, not society at large. That’s the way our legal system is structured; I understand it and abide by it. When he got within 5 or 6 feet… Lawler leveled the Glock and fired once, hitting DeCosta in the groin. A previous post discussed The Tueller Principle, or as Dennis put it originally “How Close Is Too Close?” In light of the above incident, The Tueller Principle and two related concepts bear further clarification and quantification. A concept that is seldom discussed in the personal protection community, among either instructors or practitioners, is proxemics. 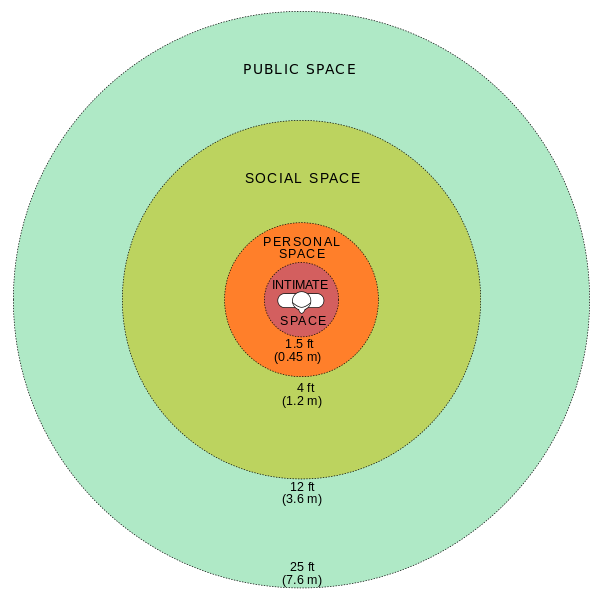 The term proxemics was originated by a cultural anthropologist, Edward Hall, in his book The Hidden Dimension. Its meaning is how we, as humans, interpret and manage the physical space around us. This should be an integral part of planning for personal protection, but usually is not. Professor Hall’s work breaks out several spatial zones that we perceive around us. Most important to us regarding the realm of personal protection is that we make instinctive judgments about whom we allow into these zones and what our reactions are to those who enter, or try to enter, the zones. Intimate Space – where we only allow loved ones to be. Personal Space – the area in which we are comfortable having people we know and trust. Social Space – the zone where we communicate and/or interact with others generally. Public Space – an area where we accept that people in general can be, regardless of whether we know them or are interacting with them. It is also important to note that Hall’s work was preceded and partially inspired by the work of a Swiss zoologist, Dr. Heini Hediger. After extensive study of animals in the wild, Dr Hediger, in his book Wild Animals in Captivity, introduced several concepts about predator-prey behavior that are particularly relevant to the personal protection community. Flight distance – the distance at which prey will seek to escape the approach of a predator. Defense distance – the point at which pursued prey, which is being overtaken by a predator, will have a ‘defense reaction,’ in the words of Dr. Hediger. Critical distance – the boundary at which prey that is cornered, or feels it is, will initiate a counter-attack on the predator. I.e., the prey has lost its ability to maneuver or escape (decisively engaged) and then reacts in an emergency mode. Dr. Hediger states that these distances “are specific, within certain limits, and may be accurately measured, often within inches.” p20 When he says inches, he is referring to very small animals; larger animals will generally be measured at intervals of feet or yards/meters. The larger the animal, the greater each distance will be, generally speaking. The questions that then arise are: 1) what is the overlap between the works of Tueller, Hall, and Hediger and 2) why is that overlap important? Hall theorized that Hediger’s concepts of flight, defense, and critical distance are no longer applicable to humans. However, I do not believe that is true. Human behavior during a criminal predation tends to follow Dr. Hediger’s concept quite closely. The incident described in the first paragraph is an excellent example of a phenomenon I observed in my long term study of The Armed Citizen and other reports of armed self-defense by private citizens. My impression after the study of thousands of incidents was that people tended to allow human predators to encroach not quite to arm’s length before shooting. When I say encroach, I do not mean actually shoot at, as in a gunfight, but rather attempt to close the distance, whether armed or unarmed. Encroaching is actually more dangerous than a full throttle attack. If an armed predator runs at us at full speed, it’s obvious what his intent is and our decision becomes fairly simple. On the other hand, an encroachment induces uncertainty into the encounter, in the form of the question “How Close Is Too Close?” Of course, if gunfire is being exchanged, then typical spatial boundaries and zones no longer apply. Shooting a human predator, especially when he is encroaching, is a communication and social transaction. It is the strongest form of communicating “Stop, don’t come any closer!” Dr. Hediger would term this the critical reaction that occurs at ‘Critical Distance.’ My impression is that it will most likely occur in what Hall termed the ‘near phase of Social Space.’ For North Americans, this zone is between four and seven feet. In other words, our Critical Distance lies within that zone. We will do what we need to do to prevent a predator from crossing the boundary between Social Space and our Personal Space. How does this relate to The Tueller Principle? The minimum safe boundary established by Tueller is 21 feet. However, the boundary that Hall theorized between public space and social space is only 12 feet. What this means is that we will have an inherent tendency to allow people, and specifically predators, to approach us well with the boundary of safety established by Tueller. That 12 foot boundary for Social Space may be the maximum boundary of our Flight Distance, even with a sketchy character. If our Critical Distance is only 4-7 feet, that could represent a major problem when dealing with a predator. My late colleague Paul Gomez periodically quizzically commented that “people don’t shoot criminals far enough away.” The relationship between the concepts of Tueller, Hall, and Hediger may be the reason why. It’s something we in the training community need to do a better job of explaining and training. Situational awareness is not just about seeing what’s going on; it’s also about interpreting that information and what to do about it. At least a half-dozen times, I ordered him to stop. Reflecting on Shunryu Suzuki’s comment – “In the beginner’s mind there are many possibilities, but in the expert’s there are few,” some frequently ignored or overlooked fundamentals taught by people who have been at this a long time come to mind. My research on ‘bad shootings’ has reinforced some things to me. 2. NEVER LET THE MUZZLE COVER ANYTHING YOU ARE NOT PREPARED TO DESTROY. The person most likely to shoot you is YOU. Why? Because you’re always there. • Muzzle direction is the primary safety; always has been and always will be. • Identify your target at night, preferably with a flashlight, before you shoot it. • Shooting isn’t always the optimal solution. • Holding someone at gunpoint isn’t as easy as it seems. Avoiding the problem (implied task) is a lot easier than fixing the problem, either at the moment or in the legal system later. A few people drink from the fountain of knowledge but most only gargle. 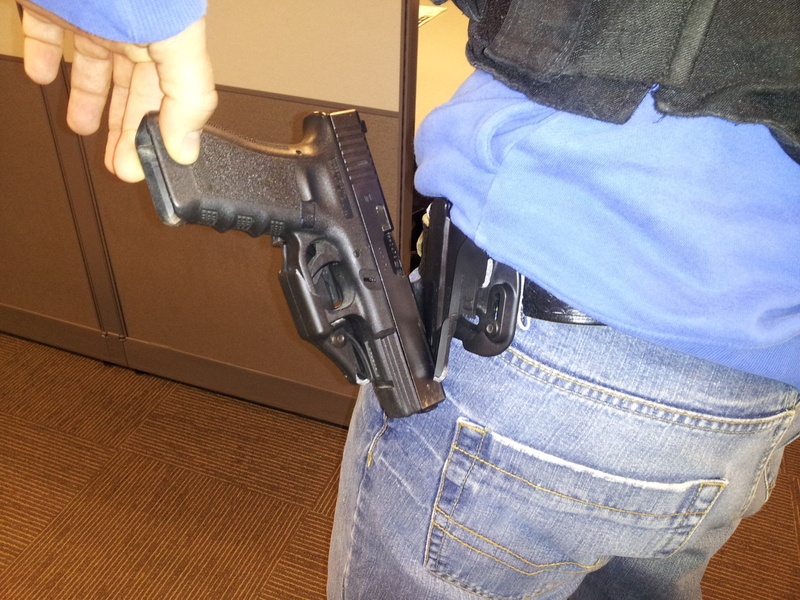 Gun Digest recently published an online article about holster retention systems. The article begins by referencing Safariland’s retention holster rating system as being the standard. Unfortunately, the author, Corey Graff, should have done a little research and contacted Safariland about their retention rating system before writing about it. That system, devised by Bill Rogers, the inventor of the modern security holster, has nothing to do with the number of mechanisms that the holster has. Corey’s interpretation is a common misconception in the industry. Safariland’s system is based on a series of hands-on performance tests in which the holster is physically attacked and tested. The holster must pass, in sequential order, each test to achieve a given level of rating. A holster can have several mechanisms on it and still not achieve any rating at all if it doesn’t pass the hands-on (literally) tests. In point of fact, the Blackhawk Serpa holster pictured in the article will not pass even a Level I rating test, regardless of the number of mechanisms it might possess. 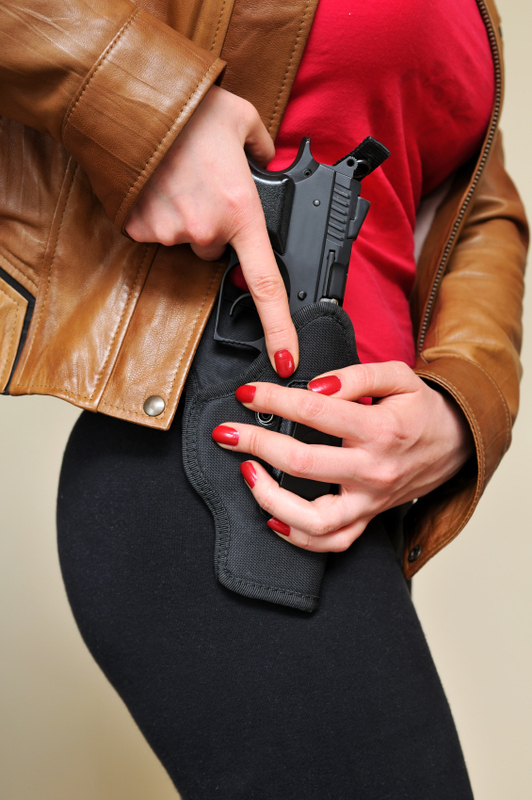 The reason is that the holster must remain attached to the belt while attacker is pulling on it with a given amount of force. Because of its relatively small mounting area where the screws attach to the belt plate, the entire Serpa holster will pull off the belt when subjected to a Level I test. Unless, of course, the holster itself breaks, which has also been known to happen, when subjected to a hands-on test. I won’t go into the plethora other unsatisfactory aspects of the Serpa holster. Unreinforced leather holsters, such as the Blackhawk leather slide holster pictured, will not pass a Level I test either. They lack rigidity in the strap holding the pistol in place and the pistol will simply pull out of the holster when subjected to a significant amount of force. This is why true security holsters must be made from a rigid synthetic material. It’s interesting that the author used Blackhawk holsters as illustrations despite the fact that they don’t pass the Safariland rating system. What is up with that, I don’t know, but it’s certainly poor research and understanding of the topic. Since this article is an excerpt from a book about Concealed Carry Holsters, I certainly hope the rest of the book is better researched and based on factual information rather than common misconceptions. Pointing guns at people you have no intention of shooting to force compliance with your demands is poor business. I agree with this statement and feel it can be even further amplified from the perspective of training people how to Control a Confrontation. The statement can be, and has been, misconstrued by the inexperienced into “I believe that the first time any bad guy should know you are armed is when he sees the muzzle flash.” As a philosophy, reluctance to display a firearm without firing is a mistake. The majority of criminals are looking for a victimization not a fight. The display of a firearm by the intended victim, along with the obvious intent to use it if necessary, is an indicator that the victimization has the potential to turn into a fight. That’s not what economic predators are looking for. Let’s consider the Policy (556.80) of the Los Angeles Police Department for DRAWING OR EXHIBITING FIREARMS. Officers shall not draw or exhibit a firearm unless the circumstances surrounding the incident create a reasonable belief that it may be necessary to use the firearm in conformance with this policy on the use of firearms. Stated as a positive action when adjudicating Use of Force incidents, the LAPD Board of Police Commissioners generally uses language similar to the following, when the Drawing/Exhibiting was ruled justifiable. The BOPC determined that all personnel had sufficient information to believe the situation might escalate to the point where deadly force may become necessary. Therefore drawing the weapon was in policy. Armed Citizens need to practice two Presentations; 1) Challenge and 2) Shoot. I use the term Presentation in a broad sense because the pistol might be in a container other than a holster, for instance, someone at home may have a pistol in a container or safe. The principle still applies. While some trainers would say this violates Hick’s Law, the fact is that the effect of Hick’s Law has been proven to dissipate when training in the various options has been undertaken. Challenging should be done from a Ready position that does not involve pointing the pistol at the aggressor, just as Ed states. If the necessity to shoot arises, the pistol is then brought on target and fired. Contrary to popular opinion, there is no time difference between bringing the weapon onto target to fire vis-à-vis having the weapon already aimed at the target. Nor is there any demonstrable difference of starting out with the finger on the trigger v. off the trigger. My experience is that very few gunowners practice the Presentation to Challenge nor firing beginning from a Challenge position. This is a major weakness in their skill sets. Challenging can easily be practiced at home with an inert (blue) gun. Anyone who is serious about improving their skillset should own a bluegun of their real defensive gun. There is a caveat to this doctrine. A friend of mine lives and works in Central America as a security consultant and trainer. His counsel to me is that, in his experience over the past three decades, Latins rarely find the presence of a pistol unsettling “unless they are looking down the bore.” With the heavy influx of Central Americans into the United States lately, this may be a consideration. I won’t be wronged. I won’t be insulted. I won’t be laid a-hand on. I don’t do these things to other people, and I require the same from them. Mine is somewhat more complex than that, but the principles remain fairly simple. They guide me every day. Thinking ‘I’ll solve it when I get there’ has gotten a lot of people killed. My friend and I had a serious disagreement over his tactics. “The cops, Gunsite grads and others, who’ve contacted me over it agreed with what I did.” Contrary to the feedback my friend received, the comments I received were universally negative toward his post-escape actions. 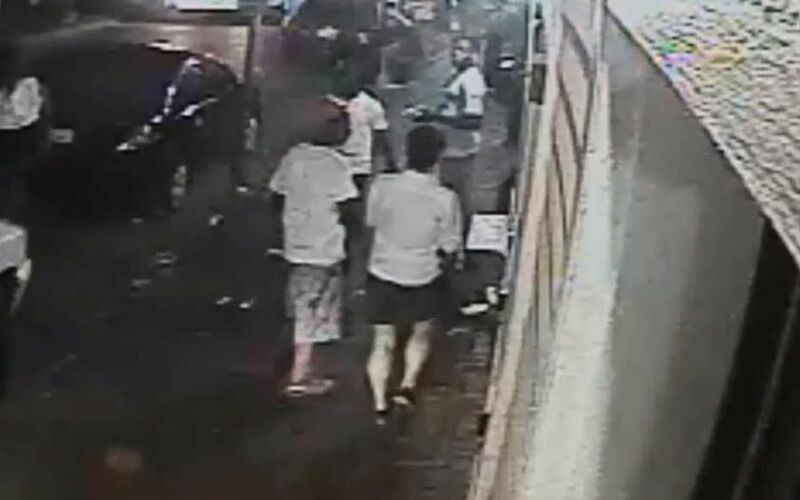 This then leads to a further issue involving his friend, who was in the car with him. What do you do when someone else makes a tactical decision that involves you? I frequently mention that anytime we are with another person, the complexity of decision making goes up seriously. You, as a passenger or bystander, can be put in a situation by someone else quite easily. Sometimes, it is a situation with possibly severe negative outcomes. Many times in ten years of Force on Force exercises, I saw how easy it is to get dragged into situations and Courses of Action not of your choosing. Not to mention the many times I have personally gotten sucked into situations that I later thought “Wow, I’m glad I got out of that one in one piece.” Other people can get you killed, without asking your permission. Let’s examine some of the possible options. Even when we are with friends and family, our options remain. Some of them are Flight, Withdraw, Fight, Submit, and Negotiate. We are conscious beings and capable of making our own decisions. Just because someone else makes a decision to place themselves in jeopardy, doesn’t mean we have to go along with it. Nor does it mean that even if we choose to participate we necessarily have to do it in a way that entails maximum risk. Let’s examine a case from the LAPD files as an example. Officer A was watching television when he heard his wife shout that someone was out front. Officer A’s wife also believed she told her husband the people outside were vandalizing the family vehicle. Officer A, with his pistol held alongside his leg, moved across the front lawn of his residence to obtain a view of the individuals [he suspected of vandalizing his car] in the street. Unknown to Officer A, his wife had followed him from the residence to the curb of the street. Two things occurred here. 1) Officer A elected to go outside to Confront the vandals. It is unknown whether this was habit as a Police Officer [LAPD discourages its Officers from taking enforcement action off-duty unless life is at risk] or because he felt compelled by the presence of his family. 2) His wife followed in into the Danger Zone, perhaps due to family bonding aspects or because she felt it was appropriate for her to confront the vandals herself. Officer A directed his wife to return to the residence and to call the police. The wife continued to be sucked in the dynamic of the situation, perhaps because of her husband’s presence outside. If he had remained inside and called the police himself, it is less likely she would have gone outside, especially the second time. Eventually, a scuffle between the vandal and Officer A’s wife ensued and Officer A separated them. The vandal then approached with an ambiguous weapon and Officer A fired a warning shot into the ground. This resulted in the vandal fleeing. Here’s what the Board of Police Commissioners ruled. The BOPC found Officer A’s tactics deficient warranting administrative disapproval. …Officer A elected to confront the subjects… The BOPC observed that Officer A’s tactical decisions left him with few tactical options and placed him at a tactical disadvantage… The BOPC would have preferred that Officer A had remained inside his residence, stayed with his family, [and] personally notified the local law enforcement agency … The BOPC was also concerned that when Officer A exited his residence, his wife accompanied him outside. The BOPC determined that Officer A’s tactics were seriously deficient warranting administrative disapproval. The evidence later disclosed that the vandal was ‘armed’ with a dinner fork. While Officer A received only ‘administrative disapproval’ for firing the warning shot, I have little doubt that an Armed Citizen in the same circumstances would have been charged with Aggravated Assault. Let’s now return to the brainstorming v. wargaming issue. Brainstorming by Officer A gave a rudimentary Course of Action of going outside and Confronting the vandal. I’m not sure that any brainstorming by his wife was involved, other than to accompany him. Wargaming might have resulted considering alternate Courses of Action for either or both of them. He might have elected to Remain In Place and call the police. Even if he went out to Confront, she might have elected to RIP. Even during the Confrontation, after considering all her options, she might have decided to RIP after she had returned to the house, instead of re-inserting herself into the situation. If my friend’s friend had done some wargaming, he might have considered, and perhaps chosen, some different options. It would be presumptuous of me to say what he was thinking when he chose to join the Pursuit. However, his options were: Pursue, Submit, Withdraw, Flight, and ultimately Fight using deadly force. If he agreed with following the criminals, then the option he chose was Pursue. Fortunately, the situation did not escalate to the Fight option but this has to be considered as a consequence of the Pursuit. If he did not agree with the decision to Pursue, then he chose the Submit option, only he was submitting to my friend’s choice. ‘To take no action is to take an action,’ as the saying goes. He could have said “I’m not going with you over to their vehicle. Let me out of the car.” That would be the Withdraw option. If the car got into motion before he could say anything, he could have gotten out of the car when it stopped behind the criminals and then he could have moved off. That would be Flight. And if the criminals produced guns, he would have been forced into the Fight using deadly force Course of Action, which at that point is not an option but a necessity. The military term would be Decisively Engaged. Decisive Engagement means we have no other options left, which is never a good position to be in. All those options have consequences. Withdraw or Flight could have serious repercussions on their friendship. Pursuit, under the wrong set of actions and reactions, could result in an unpleasant encounter with Law Enforcement. Fight using deadly force carries the possible consequence of death, which would affect not only him but all his loved ones and associates. The choices we make are based on our personal moral values and ties to others. But they should be made with a clear understanding of what our options are and also the possible consequences thereof. I would have said “I’m not going with you over to their vehicle. Let me out of the car.” But that’s just my choice, you’ll make your own.